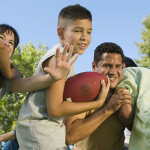 Though some kids love football, small children are often not able to sit still to watch the whole game. They are more likely to wonder in and out of the TV room to chat about their day. But to us, the game is important. 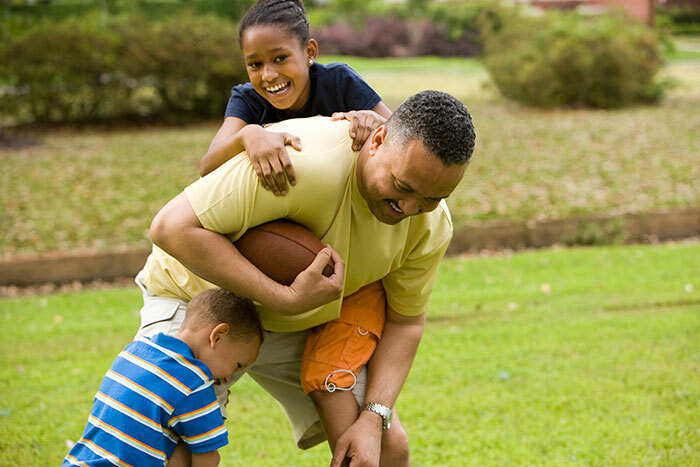 So how do we balance game days with kids? 1.) Food. Snacks. Food. And more food. It goes with football games: chicken wings, chips, popcorn, cheese dip. When it’s cooler out, bring out the hot chocolate or tea (with cream and sugar for kids!) Set a blanket on the floor and allow kids to wonder around, snack as they please, have a little picnic. 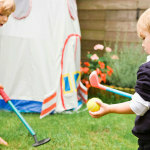 Create a tent over the picnic area and let the kids decorate it for extra fun! 3.) Let the kids play football in the backyard. Get some white t-shirts and make “Game Day Jerseys” for them to wear on game days. Let them pick numbers and nicknames. If weather doesn’t permit outdoor play, create an indoor football field bean bag toss. 4.) Let them decorate football cookies. If these look like too much work, just make circle cookies and set out icing and sprinkles in your team’s colors. 5.) Most of all, try not to be too focused on the game that you forget about the children. Sometimes keeping kids busy just means letting them be involved in what’s going on, teaching them to love the sport as much as you do. If you teach them at a young age how fun game day can be, you’ll likely foster the same love for football in them. This will set you up for a lifetime of fun game days!